Defender Mg - Kenya Biologics Ltd.
DEFENDER Mg is a liquid formulation of magnesium complexed with sugar acids derived from natural fermentation processes of vegetal materials. It is easily absorbed and translocated within plant tissues. 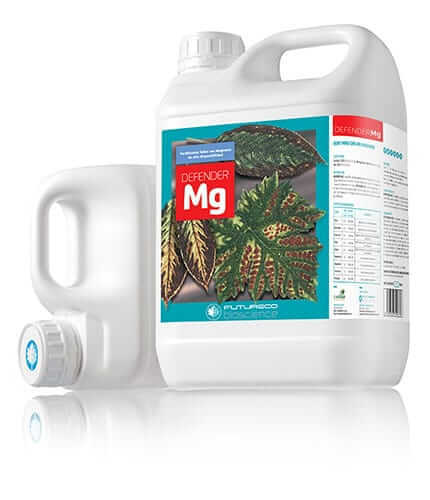 – Magnesium deficiency symptoms: As Mg is highly mobile within plants, it moves from old to young leaves as a reduction in the element’s availability occurs. Inter-vein chlorosis and reddish, orange, yellow or purple spots become evident on old leaves. – Magnesium role: Mg is essential for plants as this atom is part of chlorophyll molecules. It also participates in phosphorus uptake and transport. – Magnesium deficiency reduces photosynthetic activity causing lower crop yields. DEFENDER Mg can be used to correct and prevent magnesium deficiencies in fruit and vegetable crops. Apply with foliar spraying or diluted in irrigation water. Apply at 2-3 weeks intervals according to the crop’s needs. Use sufficient water to ensure coverage. DEFENDER Mg is stable for at least three years since manufacturing date. Keep in a cool and ventilated place. DO NOT store for prolonged periods in direct sunlight. Keep away from food, drink and animal feed. Keep out of the reach of children. *Complexing agents are acidic sugars. Pome fruits Apply once the fruit is formed alternating with applications of DEFENDER CALCIO. Citrics Buds growth in spring and autumn. Foliar applications to stimulate photosynthesis during sprouting. Repeat every 15 days. Tomato Apply since transplantation. Repeat applications at 15 days intervals. Potato Apply since 30 days after starting vegetative growth.